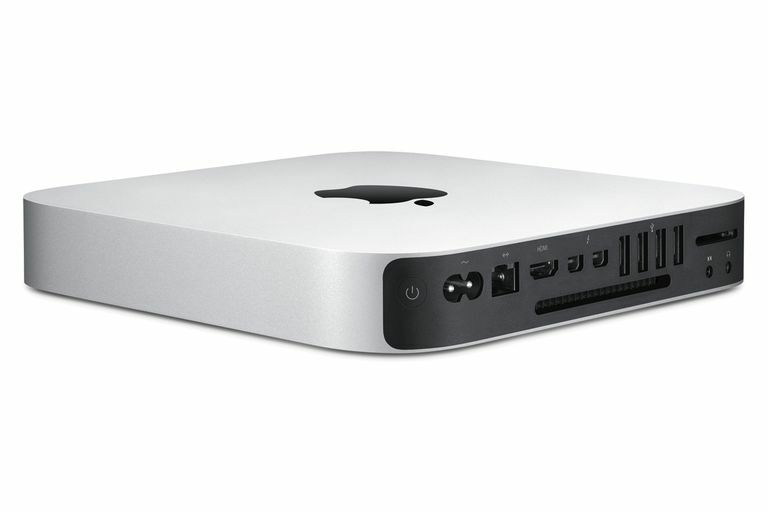 Mac mini with HDMI and Thunderbolt/Mini DisplayPort is a popular Mac for use in a home theater setup. One of the first things you may notice about your new big-screen HDTV is that it has more connections for video than your old TV ever dreamed about. It probably has two or three HDMI connections, maybe a DVI connector, a VGA connector, and at least one component video connection. And those are just the connections most commonly used for high definition. It's a shame to let all those connections go to waste. Your Mac just happens to be sitting nearby; why not hook it up to your new HDTV? It's actually a pretty easy task. A few lucky souls won't even need an adapter; for the rest of us, at least one adapter will be necessary. For best quality, your HDTV's HDMI or DVI ports are the preferred connection method. Both are capable of the same digital quality. The only practical differences are the style of the connector and the fact that HDMI supports video and audio in a single connection. If it has one, another option is to use your HDTV's VGA port. VGA can easily handle HDTV resolutions, including 1080p, and many HDTVs provide special capabilities for a computer connection that are only available on the VGA port. For example, some TVs only allow you to adjust the overscan or underscan of the signal coming in via the VGA port. Another possible option is a dot-by-dot mode, sometimes called pixel-by-pixel. This special mode allows an HDTV to display an image from a computer without applying any of the normal image manipulation that is sometimes used to stretch an image or compress it to fit. Of course, you can try all three of the primary video connections (HDMI, DVI, VGA) and then choose the one that looks best to you. If all things were equal, the two digital connections (HDMI, DVI) should provide a better image. But I don't think very many people could pick an HDMI from a VGA connection in a double-blind viewing test. Depending on the make and model, a late-model Mac's video port may be DVI, Mini DVI, Mini DisplayPort, or Thunderbolt. Although Apple has used other types of video connectors, we will concentrate on late-model Macs, because early models may not have the horsepower to adequately process, decode, and display a 1080p HDTV signal. DVI and Mini-DVI connectors on a Mac can produce both digital and analog (VGA) video signals. If you choose to connect DVI or Mini DVI to a VGA port on your HDTV, you will need an inexpensive adapter. Likewise, you will need an adapter to connect a Mini DVI connector on your Mac to a standard DVI connection on your HDTV. Mini DisplayPort and Thunderbolt, on the other hand, are primarily digital connections. There are adapters that can convert Mini DisplayPort and Thunderbolt video to VGA format, but the quality they produce may not be ideal for a home theater system. There are many sources of the necessary adapters and cables. Apple, of course, has adapters available from its online store, in the Mac Accessories, Displays, and Graphics category. While most of the basic adapters are reasonably priced, some are a bit on the high end of 'ouch.' Luckily, Apple isn't the only source for these adapters; there are plenty of places to look for them, online and in retail stores, and many are more affordable. For example, a Mini DisplayPort to DVI adapter from Apple is $29.00; you can find an equivalent adapter elsewhere for as little as $10.73. So do a little research and you'll find all the cables and adapters you need, at prices that won't make you wince. Once you determine which, if any, adapters you need, and you have the cable necessary to reach from your Mac to the HDTV, turn off both the HDTV and the Mac, and then connect the cable between the Mac and the HDTV. Turn the HDTV back on first. It doesn't need to be set to the connection the Mac is on, but it must be powered up first so that when you boot your Mac, it can recognize the TV and the resolution it needs. Once the HDTV is powered up, turn on the Mac. Your Mac should recognize the format and resolution of the TV, and automatically select the native resolution of the TV for running video. In a few seconds, you should see the Mac desktop on the HDTV. You may notice that the Mac's desktop appears to be slightly larger than the HDTV's screen (its edges are cut off); this is called overscan. Or, you may notice that the desktop doesn't occupy all of the HDTV's screen real estate (there are dark areas around the edges); this is called underscan. You can usually correct either issue by making adjustments on the HDTV. Check the HDTV's manual for information on making scan-related adjustments. They may be called overscan, underscan, dot-by-dot, or pixel-by-pixel. If your HDTV has a dot-by-dot or pixel-by-pixel capability, give this a try; it should eliminate any over or underscan issues. Some HDTVs only offer these special scan controls on specific inputs, so be sure to connect to the corresponding input on your HDTV. If after following this guide you're unable to see your Mac display on your HDTV, there are a few things to check. First, make sure you have the correct input selected on your HDTV. Some HDTVs try to simplify the input selection by masking out unused inputs. If you haven't used the video input before, you may need to enable the port in your HDTV's menus. Try a different input. If you're connecting by HDMI, try a DVI input, or even the VGA input. You may find one that will work correctly for you. Occasionally, an HDTV won't report the correct resolution to a connected Mac. When this occurs, your Mac may be driving the video for one resolution while your HDTV is expecting another. The result is usually a blank screen. You can correct this by using a utility such as SwitchResX to change the resolution your Mac is sending to your HDTV. Details on how to use SwitchResX are beyond the scope of this article. You can find tutorials for using SwitchResX on the developer's website. Once you have your Mac and HDTV working together, it's time to kick back and watch a video from your Mac. Be sure to check out the QuickTime HD trailers or movies, TV shows, and videos available from the iTunes Store.